BlackFin Capital Partners is a venture capital and private equity firm specializing in financial services investments across Europe, with offices in Paris, Brussels, and Frankfurt. The firm manages two buyout funds and recently closed its first FinTech venture fund, BlackFin Tech 1, with €180 million (above an initial target of €150 million). The fund is being invested in FinTech, RegTech, and InsurTech startups from Seed to Series C. LPs include large European financial institutions such as Bpifrance, Vaudoise Assurances Group, Groupama, Sogecap, Natixis Assurances, SwissLife, and BNP Paribas. The size of the fund allows BlackFin to support portfolio companies through successive financing rounds. The fund recently announced an investment in Ravelin, a UK-based fintech company using AI to provide fraud and risk prediction solutions for e-commerce and on-demand economy. Ravelin is the fund’s second investment focused on fraud detection. The first was a €15 million Series A investment in Friss, a Dutch InsurTech providing fraud detection software for insurance carriers. Three more investments will be disclosed soon. 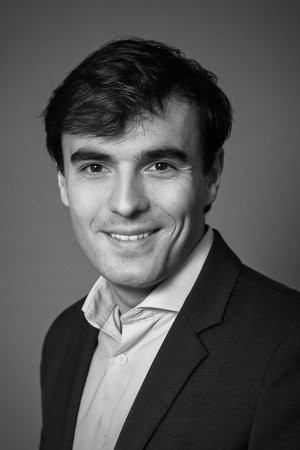 BlackFin Tech 1 is managed by five investors — Julien Creuze, Michele Foradori, Romain Grimal, Maxime Mandin, and Gabrielle Thomas. Julien joined BlackFin in July of 2016. Q. Julien, why BlackFin? What do you offer European FinTech entrepreneurs that they can’t get from other investors? A. First, we are fully focused on financial services. We invest only in financial services companies. We see most of the European FinTech and InsurTech companies and are on the cutting edge of what is going on. As a sector-focused firm, we have a good network in the sector. When we invest in a company — and we do most of our investments in B2B companies, we can connect our portfolio companies with potential customers, meaning large banks, large insurance companies, large payments institutions. This is really a key part of our value proposition, to help our portfolio companies gain access to new customers and new markets. Q. Are these large European financial services companies your limited partners? A. Yes, a lot of them from France, Switzerland, Germany, and Belgium. I would say in France we have most of the large banks and insurance companies as LPs. Q. European entrepreneurs I speak with often lament the lack of continental European investors who can lead Series B, Series C rounds. That’s the point where they have been looking to London or to the U.S. Are you consciously seeking to fill that gap? A. We mainly invest at the Series A and B stages. For A, we do see competition from European funds. For B, we also see some competition, but from European and from U.S. funds. I don’t think we are really matching that gap, in the sense that most of the deals we bid on are competitive deals. Q. What are your investment criteria? What are you looking for when you evaluate companies for investment? A. The team, obviously. The team is the key part. We want to have a superb entrepreneurial team with execution skills; people who have done that before and demonstrated with the company that they are running that they have strong execution skills. So, the team is one. Second, the market traction. We typically invest in companies that are generating revenues. And then we look at the potential. How big it can be. We have quite a big fund (€180 million), so when we invest in a company we have in mind how to make it a big success. A multi-hundred million exit – this is what we look for. So we need to have a big market and some innovation and disruption. Q. How are your investment decisions made inside the firm? A. We have a two-stage decision process. The first one is the investment team. A team of five people. We are on the ground, so we look at, we source deals, and we talk about the deals together. Then we have an investment committee with the founding partners of BlackFin where we take the decision. Q. What’s the average size check you expect to be writing? A. The range for the initial investment is €2 – €15 million. The average so far is €5 million – €6 million for the first check. Q. And you intend to follow-on in subsequent rounds with companies that merit it? A. Yes. For every investment we make we allocate at least one time and sometimes twice the initial investment for subsequent rounds, if not more. Q. Are you usually the lead investor? And do you always take a board seat? A. We typically act as lead investors, though we can also co-invest with others VC funds. And we always get a board seat. Q. You’ve made two investments since announcing the first close last year. Is that about the investment pace you are expecting, or do you think the pace will accelerate in 2019? A. We had the final closing of the fund in June of last year. 2018 was really a ramping year. We actually made three deals in 2018. Only two were disclosed. And we made two more in January. They will be disclosed soon. The target is to make four to five deals per year. Q. What is your sourcing strategy? A. A few things. The first one is our network of venture partners. We have 38 venture partners today who are former entrepreneurs, former heads of banks, insurance companies, payment institutions from across Europe covering the main innovation hubs. These guys act as private investors in early-stage businesses, so they have access to early-stage companies. This is one part. BlackFin was created ten years ago as a private equity investor. We have a few buyout investment funds and we interact a lot with the CEOs of the portfolio companies of these private equity funds. They bring us a lot of opportunities. That is the second part. And then we also do a lot of outbound. We go to events, we travel quite a lot to get access to the startup companies we like. Q. What sort of synergy will there be between the BlackFin’s venture fund and the buyout funds, beyond referrals from portfolio company CEOs? A. We are operating in the same sectors so there are a lot of insights that we can share as a team. Also, most of our portfolio companies from the FinTech fund are already working with portfolio companies of the buyout funds. For example, Friss, a provider of insurance fraud detection software, is working with CED, the leading insurance claim management company in the Netherlands, and we are helping Ravelin to get access to payment services providers, one of their first client for them in this segment is a portfolio company of the buyout funds. We can help with that. Q. Within Europe, which geographies are most interesting to you today? Do you have preferences? A. Europe is small, in a way, so we prefer to invest in the best ideas we can find wherever they are based, but France, Germany, Benelux, Switzerland, Spain and the UK are where we spend most of our time. It’s maybe 90% of our time there and 10% elsewhere. Q. Has Brexit made London‘s FinTech ecosystem less attractive to you as an investor or is it really not a factor at this point? A. For us, being based in continental Europe, we look at the UK as a market where we can find good companies that are acting at European scale. We are interested in companies based in London that are operating all over Europe, not in pure UK for UK businesses as we don’t bring much value to them. Q. Are you still planning to deploy the largest part of the fund in B2B and B2SmallB companies? A. Yes. A big part of the strategy is B2B, on one side serving the large institutions and on the other side serving the smaller companies. This is the main part of what we do, but we do maybe 30% in B2C as well. Q. You’re obviously keen on fraud detection. Which other areas of Fintech/InsurTech/RegTech are most compelling from an investment standpoint today? Which emerging themes or technologies do you feel have a lot of investment potential? A. In terms of sectors, we’ve looked at payments, we’ve looked at insurance. We’d like to do more insurance investments. In terms of technology, AI is transforming the financial services industry. But we also like simpler plays where the execution skills of the founding team are the stronger asset. Q. What are your thoughts on blockchain? A. Blockchain is something where we’ve been quite skeptical about for some time. That might evolve, but for the time being, while this is an interesting technology, we have not really seen great investment opportunity there. Q. You’ve published a very helpful map of the French FinTech ecosystem in conjunction with our friends at France Fintech. In your view, what are the strengths and weaknesses of the French FinTech ecosystem versus other regions? Are there particular sectors of FinTech that France excels at more broadly in comparison to other regions? A. First, it’s a newer one, compared to the U.S. I was in the U.S. from 2012 – 2014. I saw a huge wave of FinTech investments. It was barely existing in France at that time. It started in Europe in the UK and then in Germany; France was really lagging behind. We are in France three years behind in FinTech investments and in terms of FinTech successes. Revolut and N26 are from the UK and Germany, not from France. We do have a few strengths in France. The first one is there the huge public incentive for creating companies and for supporting the development of new companies. Bpifrance is doing an amazing job to support the ecosystem and help it to mature. And, there are some talents — when we talk about AI, there are some good engineering schools in France. And we have many good deep tech companies in France. To be fair, the venture community has matured a lot in the last five years. And, now we see some entrepreneurs that have had success in the past that are launching new companies or investing in new companies. We do see the sector maturing now and I believe we will see some success in the coming year. There are a few companies that are getting to big scale in France, like Qonto, which is a B2B neobank. Like Lendix or Younited Credit on the lending side in continental Europe. Ledger is another big one. They develop wallets to store your crypto assets. Q. France has a reputation as being a difficult place to do business, primarily because of social charges and work rules. Is that still fair? A. This is changing, step after step. To be fair, on the startup side this has changed a lot. Innovative businesses pay less social charges for their employees with the Jeune Entreprise Innovante (JEI) program. Innovative companies get huge tax credits on their R&D expenditures as part of the Credit Import Recherche (CIR) program. There are plenty of incentives for startup companies, and I think for startup companies, starting in France might be easier than starting in other countries. The workforce is also less expensive than in the UK and in the U.S., for sure. Q. Are FinTech startups in Europe able to find all the talent that they need? Is the talent pool deep enough to support all the FinTech activity we’re seeing? A. Yes, this is really a challenge. Tech people and data people are a very scarce resource and they are becoming quite expensive. In Switzerland, the UK, Germany, and France it might be a challenge to hire the best ones. It takes time and it’s expensive. We are seeing some companies placing development centers in other geographies like Spain, Portugal, and in Eastern Europe, as well. Outsourcing or hiring people there makes sense in some respects when you look at the price of hiring a software developer in Lisbon compared to the price of hiring in the UK. Q. If you were advising a B2B U.S. FinTech startup looking to establish an office in Europe, which city would you recommend? A. It’s a tough question. It really depends on the business. The tough part is that if you want to do business is Germany, you need to have German guys on the team; to do business in France, you need to have French guys. I would start by finding a client, or a few customers, and leverage these clients to set up a first office and then hire people from different nationalities to sell to into other countries. Q. PSD2 took effect last year. What are your thoughts on its investment implications? A. PSD2 was adopted a few years ago but will come into force this year. We believe it’s going to change the way people interact with their banks. More and more players will get in between the bank and the end customer — aggregators, personal finance apps, new payments methods. I believe it is going to be big change. But is will take some time. It’s going to change the way the sector is structured, but not overnight. I believe we will see open architectures more and more. Today, your bank will propose to you only their products. Over time, we will see more marketplaces where you can buy products from other institutions from your bank. For instance, your mortgage may be from a third party. Your savings plan may be from a third party. I believe we will see banking services unlinked more and more, and PSD2 is one piece that helps us get there. Q. Do you see a change in the way established firms and FinTech startups relate to each other in the last year? A. Banks and insurance companies have put together various ways of working with startup companies. They’ve created incubators, they’ve created funds to invest in startup companies. Insurance companies tend to be a bit more open to working with startup companies, which may not sound natural but I see it on a daily basis. For instance, for fraud detection, they are open to working with startup companies. For customer involvement, as well. I see a lot of interaction between insurance companies and startup companies. For banks, you have to find a way not to be perceived as competitive. Being far from the core business is fine, but when you get too close to the core business it’s really tough to create a long-standing partnership. Q. One of the more notable tie-ups between a big European bank and a FinTech startup has gone south. As someone who wants to sell his portfolio companies to larger firms, what guidance can you offer about getting an acquisition like this to work? What to advice do you give founders to help make sure they’ll be happy a year down the road? A. Get a high price! One thing in the financial services industry is that when acquirers like an asset they can pay a high price and pay cash. There have been some good exits in the sector. But as you say, the tough part is to make it work after the acquisition. You have to make sure incentives are aligned. We’ve seen some companies being well integrated in larger groups because the DNA of the group is well adapted to working with startup companies. I think of BBVA, or in France, Credit Mutuel Arkea. They really know how to partner and they know how to work with startup companies. Q. What will the fundraising environment be like in 2019 for Fintech startups in Europe seeking seed money or a Series A? Will it be different for companies that are raising a B or C round? A. Today we are in a very bullish environment still. We are seeing companies raising huge amounts at very good valuations. It’s still a very good time for fundraising. There is some intense competition on the better deals. The question is about the decrease in the stock markets, tech stocks have lost a significant percentage in the last months. We aren’t seeing it have an impact in the private markets, but there are some question marks for 2019. It might be the turning point. But still today the better companies are raising in very good conditions. Q. What else would you like people to know about BlackFin? A. One thing is that a lot of the companies we invest in are super excited by the U.S. market. We’ve made some co-investments with U.S. firms and I think we will do more over time. It makes a lot of sense for a U.S. investor to have partners in Europe. They want to do investments in Europe and we want to do investments with them. We are happy to do more with them. A. We have the hello@blackfincp.com address which is a way to contact us. Otherwise we have open LinkedIn profiles where people can get in touch with us. This entry was posted in FinTech, Venture Capital and tagged BlackFin, Europe, France by jim. Bookmark the permalink.